Who is YOUNG JUSTICE: OUTSIDERS’ Halo? 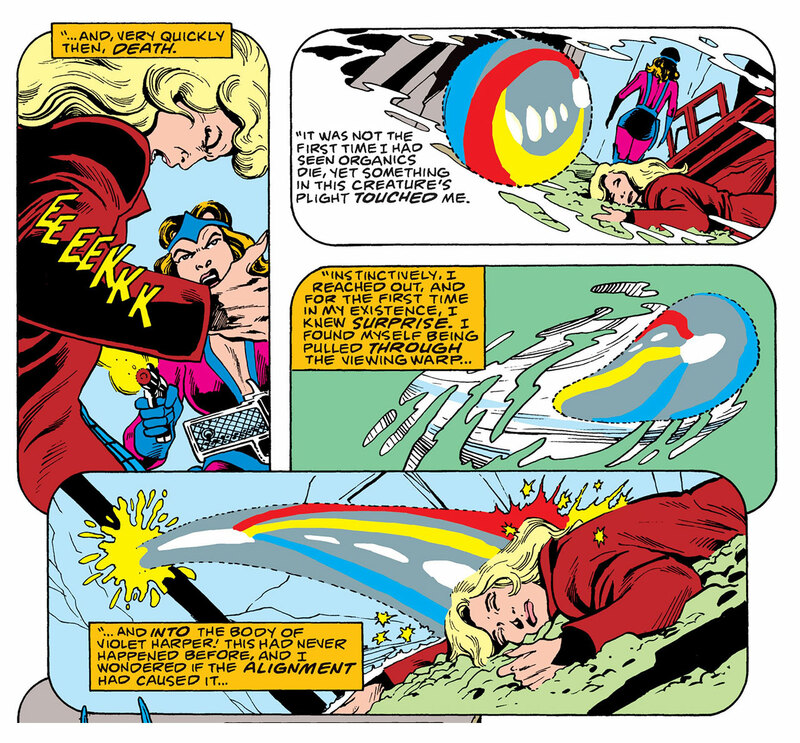 While Batman was on a rescue mission in Markovia (in Batman and the Outsiders #1, written by Mike W. Barr and penciled by Jim Aparo), he came across a young blonde girl who was disoriented and malnourished. Batman dubbed the girl Halo due to the glow she emitted. Halo soon found that she was able to wield different types of powers (including flight, energy blasts, and healing) based on the color she omitted. Halo had no memory of her life prior to Batman finding her, but the Dark Knight told her he would investigate her origins if she assisted him in his rescue mission. Teaming up with Black Lightning, Metamorpho, Katana, and Geo-Force, Halo was able to rescue Batman’s friend Lucius Fox and liberate the country of Markovia. The heroes, who called themselves the Outsiders, decided to stay together and began operating out of Gotham City. Halo, who grew tired of being called "Jane Doe," chose the name Gabrielle and became “Gabby Doe”. Batman placed her under the care of Katana, since she had lost her family and Batman thought the living arrangement would be good for both of them. Gabrielle enrolled in school and attempted to live the life of a normal teenage girl during her off-time. But she struggled with constant nightmares due to not knowing who she was and where she came from. Tatsu, whom Gabrielle had come to look at as a mother, comforted her and pushed Batman to investigate her origins. Halo and Geo-Force also grew closer and started a romantic relationship. In Batman and the Outsiders #16 (written by Barr and penciled by Aparo), the Dark Knight and private investigator Jason Bard finally uncovered Gabrielle’s origins. Gabrielle learned her birth name was Violet Harper, and she reunited with her parents. Alas, Katana was heartbroken to lose her ward, and Geo-Force agreed to put their romantic relationship on hold. Although Gabrielle was back with her parents, she still had no memory of her prior life. Though it soon become apparent to her that Violet was not a good person. Classmates avoided her, and those who didn’t were hostile to her; and her father accused her of faking her amnesia. 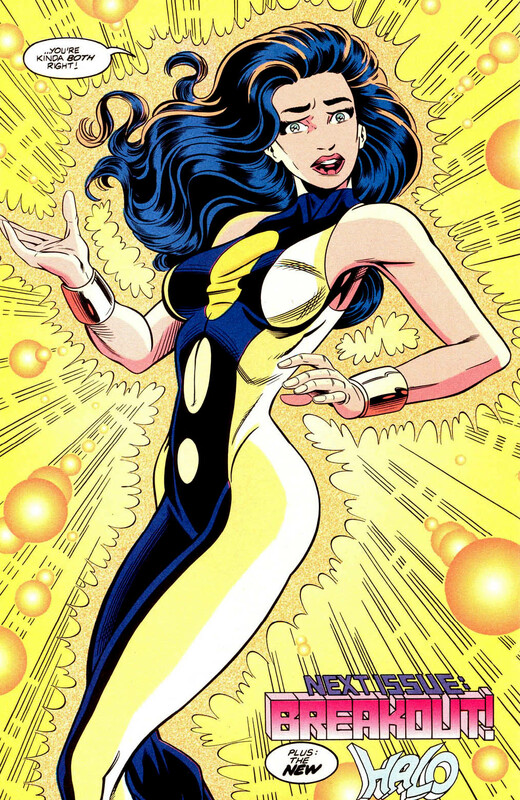 Halo kept in touch with the Outsiders, and mutually ended her romance with Geo-Force on good terms. 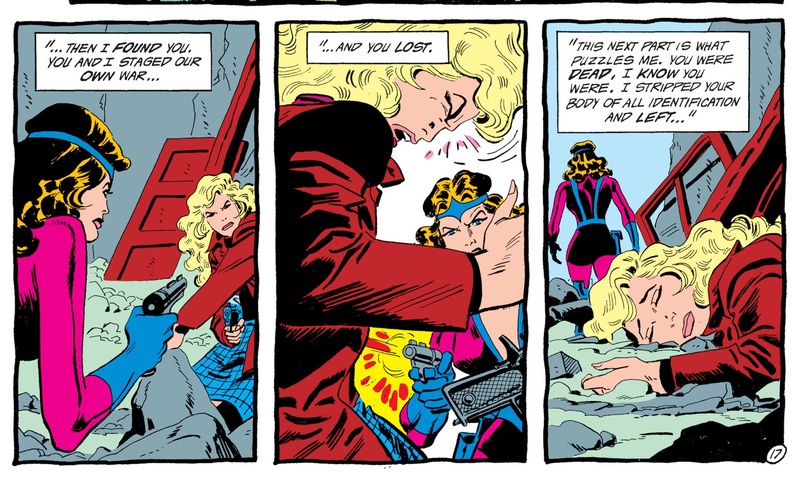 More of Violet’s past came to light in Batman and the Outsiders #20 (written by Mike W. Barr and penciled by Jim Aparo). The evil Tobias Whale and his enforcer Syonide kidnapped Gabrielle and her parents, to retrieve a formula she had once stolen. It turns out that months earlier Violet and her boyfriend Mark had allowed a man to die in a car crash after finding the formula in his briefcase. Violet used her photographic memory to learn the formula, and then destroyed the papers on which it was written. Realizing she and Mark were sitting on a goldmine, the two fled to Europe in hopes of selling it to the highest bidder. Violet had betrayed Mark and killed him so she could keep all of the money for herself. Tobias Whale had been searching for the formula, so he'd sent Syonide to Europe to catch the teens. Syonide then caught up with Violet in Markovia and killed her... Gabrielle was horrified to learn of the things she'd done. The Outsiders were eventually able to save her from Tobias, but Gabrielle’s parents were caught in the crossfire. Even though she still had no memory of her past, Gabrielle had grown to love the couple and grieved for them. A distraught Halo returned to Gotham City and Tatsu’s care. Dr. Helga Jace finally unlocked Halo’s memories in Batman and the Outsiders #22 (written by Barr and penciled by Alan Davis). Using machinery aboard the Justice League’s satellite headquarters, Halo learned she wasn’t human! Instead, she was an immortal extraterrestrial being of light from a race called the Aurakles. Halo had witnessed Violet’s death and grew curious. She then pushed herself into Violet’s body, reanimating the corpse moments before Batman had met her. Instead of bringing her comfort, the knowledge of her true origins only furthered Halo’s identity crisis. As a thousand-year-old being, she had to come to terms with the fact that she’d now one day die. She also felt guilty for taking over the body of Violet Harper and wondered if the bonding process had murdered the human girl. Halo ran away to a cult to rethink her life. While there, she became engaged to one of their members named David. It turned out that the cult was secretly run by the villainous group Kobra. After the Outsiders took down the cult, Halo rejoined her team and ended her engagement to David. Halo came to terms with her mortality and decided to take charge of her life. Since she was now neither Violet Harper nor an Aurakle, she got herself an new haircut and later a new costume while carving out her own identity. Eventually, during a battle with the alien Manhunters, Halo took a blast while defending Katana. She fell into a coma and was kept in stasis for years. When Halo awoke from her coma, she joined a new team of Outsiders. Katana and her teammates began noticing that Gabrielle was acting more aggressive than the Halo they remembered. In 1994's Outsiders #7 (written by Mike W. Barr and penciled by Paul Pelletier) the team finally learned the shocking reason why. It turned out the sociopathic Violet Harper was still alive and fighting Gabrielle for control of Halo’s body. Before the Outsiders could work out what to do about this dilemma, Halo was killed by an assassin named Sanction. It turned out that Halo survived, and her Aurakle self was transferred into the body of Marissa Barron. Marissa was the ex-wife of Technocrat, one of the Outsiders' allies, and had been slain in the same attack that had murdered Halo. This new arrangement led to some complications. Technocrat was drawn to Halo since she had the body of his ex-wife, but Gabrielle did not return those feelings. Meanwhile, another teammate, Faust, had begun a relationship with Gabrielle when she possessed Violet Harper’s body. But the Marissa fusion of Halo was hesitant about continuing their romance. Gabrielle missed her younger body and never truly felt comfortable as Marissa. 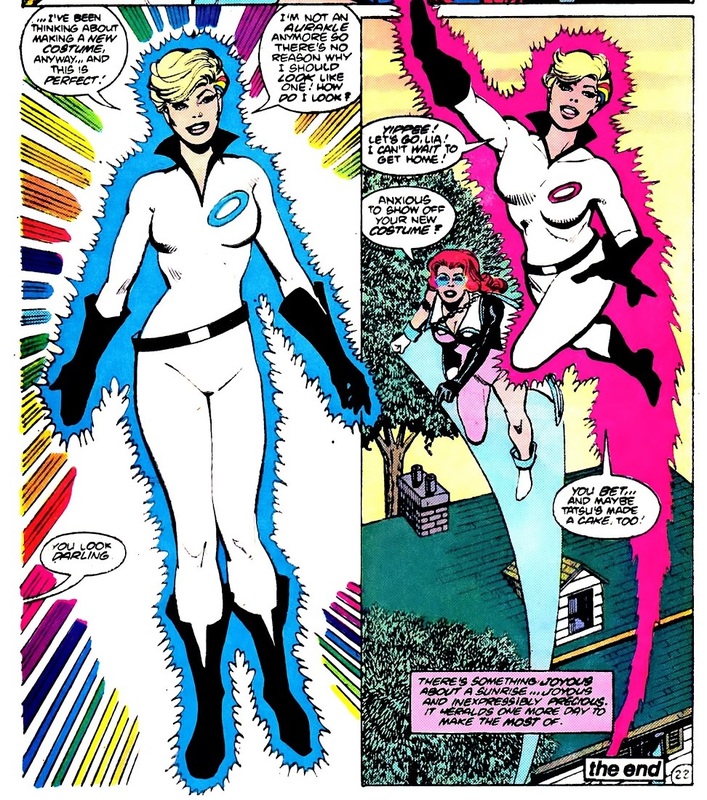 In Outsiders #16 (written by Barr and penciled by Pelletier), Halo was shocked to find Violet Harper’s body had been reanimated by Kobra. Gabrielle was unsure if the body was inhabited by Violet’s original personality or the soul of Marissa Barron. Violet, however, escaped before Gabrielle was able to get her old body back. Over time, the Outsiders drifted apart again, and Halo was seen operating in Violet Harper’s body again. 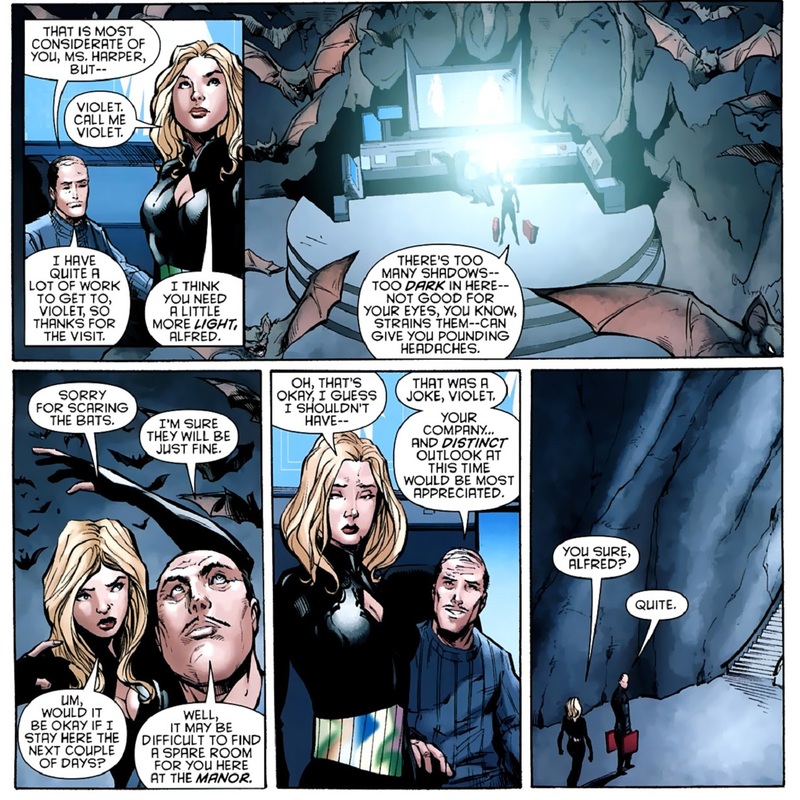 When Alfred Pennyworth invited Halo to rejoin the team in 2009's Outsiders #15 (written by Peter J. Tomasi and penciled by Lee Garbett), she finally began feeling comfortable identifying herself as “Violet Harper." Halo later joined a special group of Outsiders operating within Batman Incorporated. After they were presumed dead, this group dubbed themselves the “Dead Heroes Club” and used their deceased status to operate more covertly. After the reality-warping events of 2011's Flashpoint, much of Halo’s history was erased and she found herself back in Markovia with her memories lost. Katana, who was now a member of the Suicide Squad, rescued the teen and took her in. 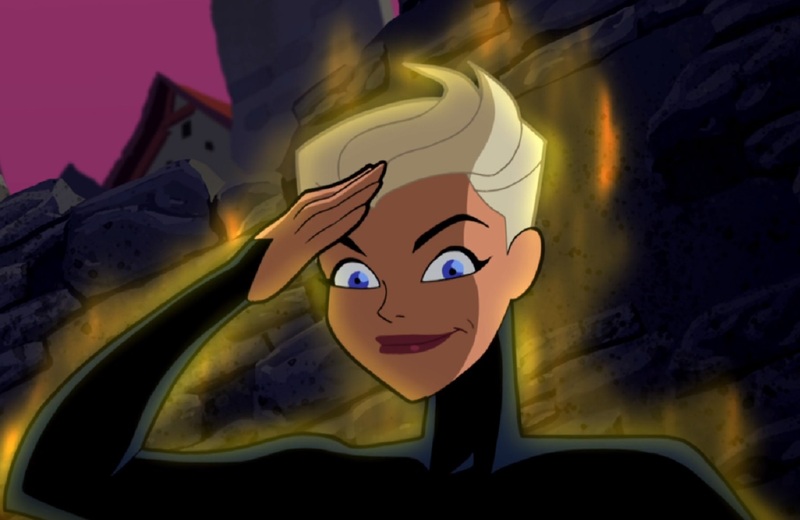 Halo has also been in the Batman: The Brave and the Bold episode “Requiem for a Scarlet Speedster” (pictured below). In the cold open for this episode, Halo and the original group of Outsiders fight the terrorist group Kobra. 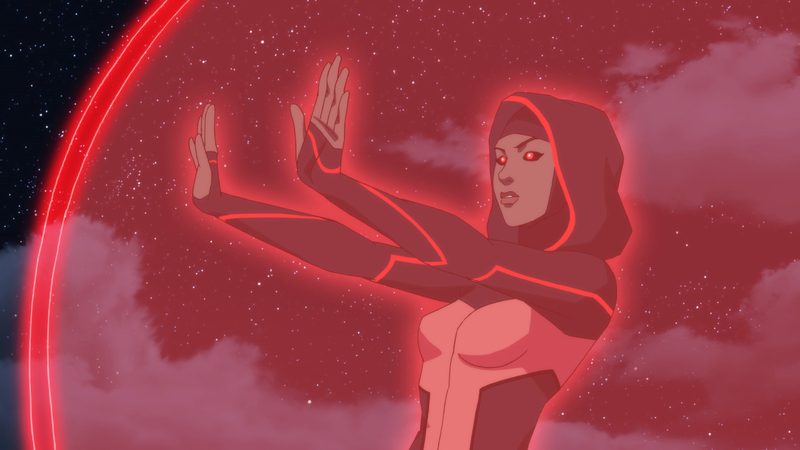 Of course Halo can now be seen in Young Justice: Outsiders, in which she struggles with her sense of self as she trains to be hero alongside Forager and Geo-Force. Are you a Halo fan? Let us know in our Community!